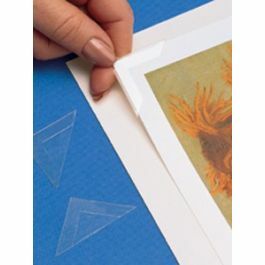 For conservation mounting of artwork and photos, look no further than our MC2 Clear Polypropylene Mounting Corners by Lineco. These standard view 1 1/4" corners are simple to use for artwork, photographs, documents, and certificates up to an 11" x 14" size. Press the acrylic adhesive to mats or backing board for a secure fit. The adhesive never comes into contact with your work! Acid- and static-free. We offer a line of Lineco Polypropylene Mounting Corners in both standard and full view styles. These MC2 corners measure 1 1/4" and come in standard view. 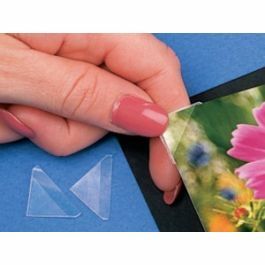 The acrylic, acid- and static-free adhesive is easy to apply and never comes into contact with your work. Ideal for mounting artwork, photography, documents, and certificates to mats and backing board. These corners work well for up to an 11" x 14" size and can hold light to heavyweight pieces. The polypropylene material is non-yellowing and is free from harmful chemicals. Pressure-sensitive corners are activated by pressing them into place, providing a secure fit and long-term protection for treasured items.